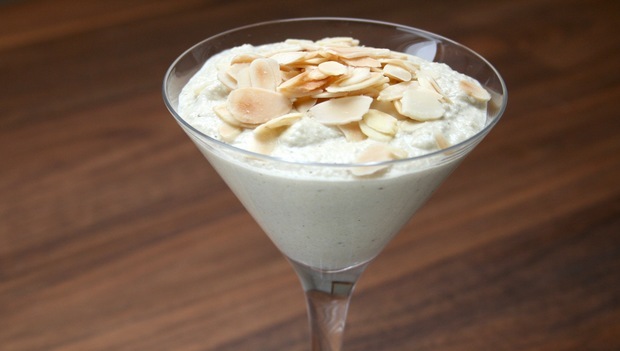 When you have one of those moments when you want something sweet but don't fancy having to spend too much time, this dairy free apple tahini mousse is perfect. Not only delicious, extremely light and super simple to make, this dessert is one that everyone loves.You can prepare before your meal or afterwards as an impromtu surprise! Place the slivered almonds on a baking tray and place in the oven at 180°C. Roast for approximately 10 minutes stirring occasionally, until golden. Place to one side to allow to cool. Place in a blender the cut pieces of apple and add the lemon juice, secure the lid of the blender and blend until smooth. You may need to stop and scrape down the sides in between blending to get it all smooth. Add the tahini and vanilla and blend again until smooth for approximately 1 minute. Transfer the purée mixture into a mixing bowl and put to one side. In a stainless steel bowl add the egg whites and beat until stiff. With a metal spoon gently fold the stiff egg whites in with the apple and tahini purée mixture. Be careful not to over stir, take your time and evenly fold through the whites. You can serve straight away into bowls, glassware or tea cups and then sprinkle the slivered toasted almonds on top. The apple and tahini mousse can also be refrigerated and kept chilled until ready to serve – take out of the fridge 10 minutes before serving to allow the mousse to be at room temperature. The recipe can keep for one day refrigerated. Delicious for breakfast if there is any left overs! You can use different types of apples for different flavours.